These famous lines are the beginning of a poem, Trees, written by Joyce Kilmer in 1913. Trees have inspired poets, writers, photographers and artists through the ages. Perhaps there is a tree that inspires you? Although I love flowering trees and trees that wear glorious colors in the autumn, my inspiration comes from the texture of trees. I love the shapes of trees, like the beautiful Angel Oak tree below. But most of all, I love to take a closer look at trees to appreciate the grain of the wood and the tiny mosses and lichens that they host. Below, I've shared some of the trees and textures that inspire me. 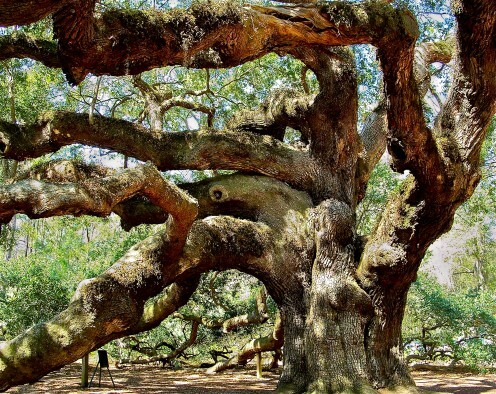 The Angel Oak Tree on John’s Island, SC near Charleston is a 1,500 year old live oak tree. 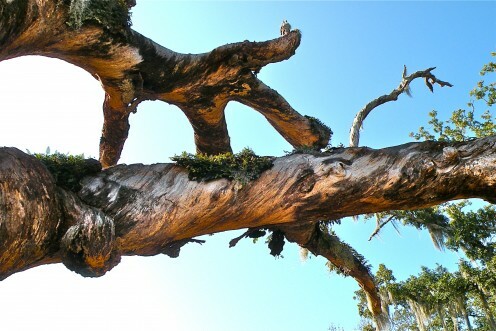 It is the oldest living thing east of the Rocky Mountains. 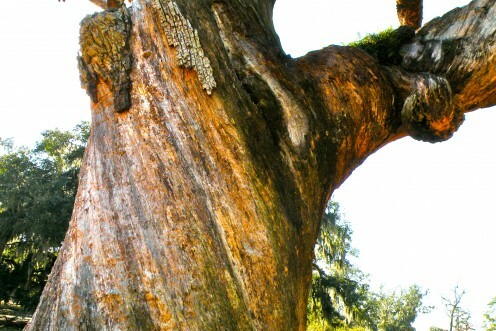 The trunk of this amazing tree has a circumference of 25 feet. The branches spread 160 feet across and cover 17,100 square feet of ground. It is 65 feet tall. In spite of all these statistics, there is nothing that can impress you as much as standing in the little park and viewing this majestic tree in person. Spanish Moss - Not Moss, Not Spanish! Spanish moss, found in humid areas of the Southeastern United States, is a common sight in Georgia, Florida and other southern states. It drapes live oaks and some other trees in romantic lace that turns from gray to green when it rains. 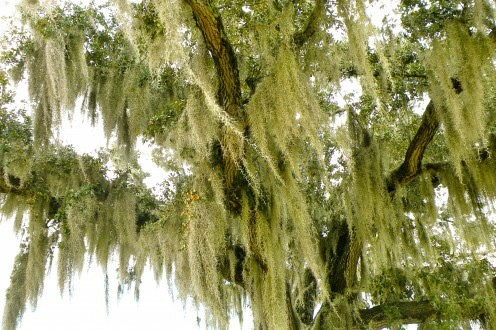 Spanish moss is not related to mosses or lichen, but is classified as a bromeliad. Although it can slow the growth rate of trees because it blocks the sunlight, it doesn't harm the trees. It lives on air and sunlight and rain. There's something magical about that. The trees below are stripped of bark and leaves, but their size and twisted branches and trunks are proof of the hardships they endured before finally dying. The turns in the branches and twisted grain in the tree trunks are from strong winds constantly pushing at the trees. These trees are in Louisiana in Fountainebleau State Park located on the shore of Lake Pontchartrain not far from New Orleans. They survived many hurricanes before they finally gave up. 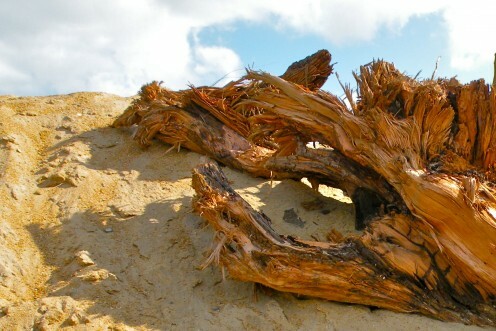 Driftwood on the beach in North Carolina is frayed and damp. What was once a tree decked out in beautiful leaves or fragrant needles is now an unidentifiable piece of driftwood lying on the sand. But its life is not over. Someone is sure to come along and notice that this beautiful piece of driftwood is nature's sculpture, and that will make a beautiful landscaping centerpiece in a lawn or flower bed. Trees dress the landscape with their texture, colors, shapes and beauty all year around. I particularly love the textures of trees. I enjoy looking at the bark and grain of the wood closeup, examining the bark and the lichen and mosses that grow on live trees or old deadwood. When wood is wet, the textures and grains are more prominent. 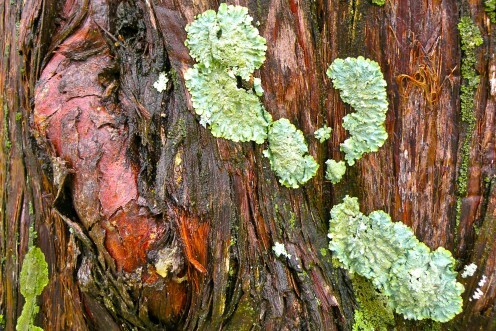 Wood will darken and interesting mosses and lichens will seem brighter. There is no better time to look closely at trees than in the rain or after a rain. 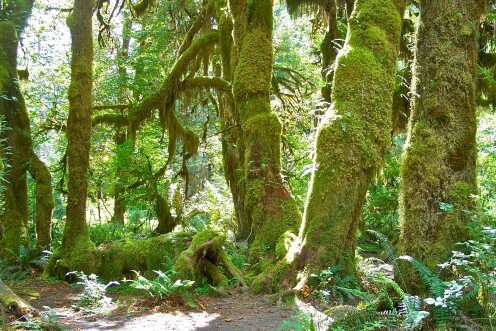 In the Hoh rain forest, part of the Olympic National Park in Washington, trees are covered with mosses, ferns and lichen. Bromeliads hang from the branches forming a mystical, other-world effect. Even the fallen, rotting trees are nurseries to new growth, providing nutrients and shelter for young trees. 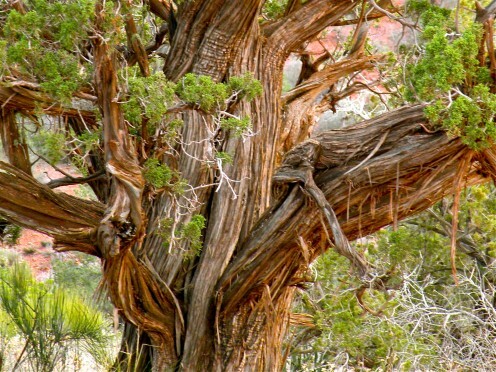 This ancient cedar tree is twisted and frayed. The wood grain is splintered and rough on the trunk and branches, yet it tenaciously clings to life. There's something heartening about seeing the clusters of green leaves on this beautiful old tree. 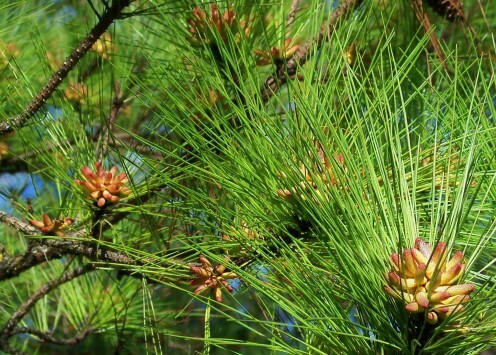 Have you ever looked closely at the evergreen trees in the spring? 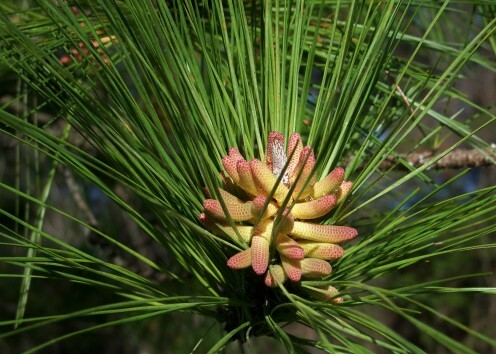 Their needles brighten and the beginnings of pine cones are evident in the pretty buds tinged with pink and yellow. Look closely, and you will see the odd formations that will someday be the dry pine cones that you might collect for your fall and holiday decorations. I hope that these photographs have given you a fresh look at trees. Perhaps they will inspire you to write a poem, paint a picture or imagine a story. Perhaps you'll be inspired to take your camera out in the rain and take a walk in the woods. Enjoy the trees around you through the changing seasons, but don't forget to take a closer look - there's much more to see! Showcase your photographs or publish your fiction, non-fiction or poetry - it's FREE on HubPages! In fact, you can write on any subject that interests you and make some money, too. Click here to sign up for free! Meditate on the beauty of trees. Use your mind and breathing to reach a peaceful place where stress and anxiety melt away. Altered images of trees and flowers enjoying the company of light. Pictures of the "largest living thing on earth" and other sites within these magnificent national parks of Sequoia and Kings Canyon are here to be seen in California. Toytasting - Thanks for stopping in to read and comment on my article about beautiful trees and their textures. Glad you liked it! Tillsontitan - Thanks so much for your kind comments! Each day I'm newly amazed by the beauty of nature, especially trees. Today I marveled at the fir trees after a rain shower...the contrast of the wet, black bark against the bright green grass and the lacy branches is amazing. I'm so glad you enjoyed some of these favorite photographs with me! I can't believe I missed this beautiful hub! "I think that I shall never see a poem as lovely as a tree"....this hub is the perfect example of that line. Your photos are amazing and make me almost feel the cool air under a majestic tree. Thank you SunShine for sharing this hub! Thanks so much, Peg Cole! When we stood under that tree, I did think about the history that the tree had witnessed. It's incredible that any living thing could have survived so many years. Your pictures are amazingly beautiful. Imagine what that first tree has witnessed over the past 1500 years. Loved those pine cone buds and the driftwood. Wonderful presentation. Rebeccamealey - What a wonderful arrangement that must have made - pine cone buds and dogwood sound absolutely lovely! Thanks so much for coming by to read and comment! Vocalcoach -Perhaps in a former life you were a dryad, a nymph of the oak, like Audrey. :) I'm so pleased that you liked my photographs so well. Your comments truly touched me! I just found pine cone buds this week, and I made a lovely arrangement with them and wild dogwood. It was awesome. 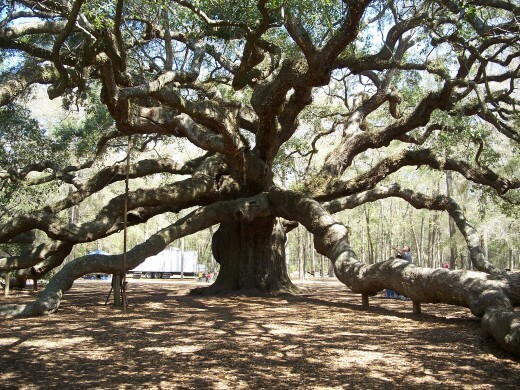 I used to live on James Island, near John's where the great Angel Oak is. Great photos! Stephanie - What a glorious treat this is! I feel such a strong connection to trees sometimes I wonder if at one time I actually was a tree. Your photos are stunningly beautiful - as if each one is calling out to me. By the looks of the comments left by your many fans, I'm not the only one that feels this way. Such a wonderous gift! AudreyHowitt - Some of these trees are so mystical and magical, aren't they? I can imagine you as a tree nymph, Audrey! Thanks so much for stopping in to comment and for giving me that lovely image! KrisL - Thanks so much for your kind and touching comments! The Angel Oak is the biggest and most impressive tree I've ever seen, and I was thrilled to have seen it in person. Absolutely lovely. Thank you Stephanie for writing this hub and and thanks to Chef-de-Jour for sharing it. I love live oaks, but that has got to be the most beautiful (and biggest!) one I've ever seen. I'm sharing too, and tweeting. 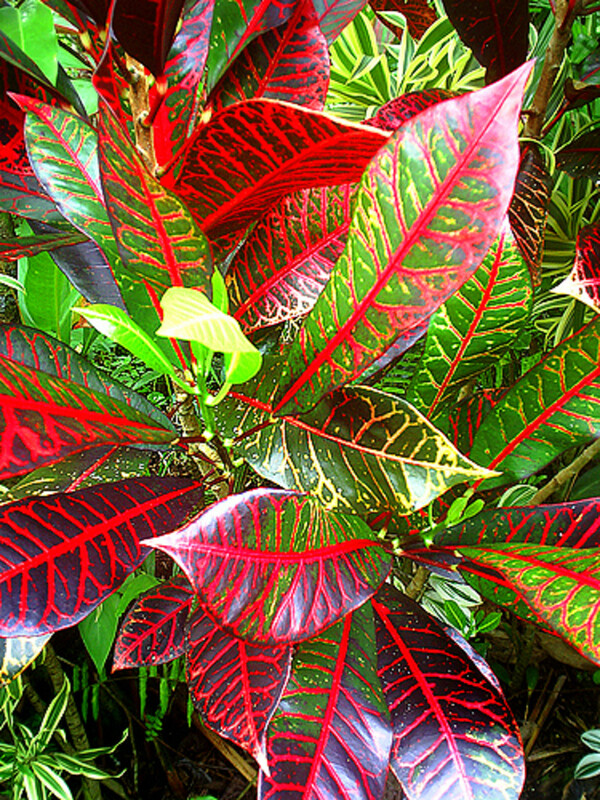 prettyntjob30 - I'm so glad you enjoyed my article on beautiful trees and their textures. The Angel Oak is truly magnificent. I was thrilled to have seen it in person. Thanks so much for your comments and the share! Chef-de-jour - The Angel Oak is really a spectacular tree. While the photographs show its spread, its hard to get the full impact of its size from a picture. The branches do create a magical place! Thank you for stopping in to read and comment! Thanks also for the share! Great hub, voted up and shared. The Angel Oak is gorgeous, I love how its branches look like they are falling. Tremendous photographs and a wonderful look at tree textures. The Angel Oak particularly interests me - those long surreal branches and the way the light plays on the bark. Such a fascinating species of tree the oak - so many variations of quercus! pstraubie48 - When I see an ancient tree, I often think about the things it might have seen. It's hard to imagine any living thing that is 1500 years old. What history has occurred under the spreading branches of the Angel Tree! I'm glad you enjoyed the photographs - thanks so much for your comments! I love love this. I often say that in my past life I must have been a tree as i am totally captivated by them. The ones who have provided photos here made me say, WOW. The oldersters that have been on the planet far longer than we have stories to tell for sure. Observing textures is certainly a way to look at them with fresh eyes. Cclitgirl - I love trees-I'm fascinated by their different shapes and textures. I'm so glad you enjoyed my article, and I really appreciate your very kind comments and the link. I'll be watching for your new hub on the Parkway! The lushness of the Carolinas makes for some beautiful trees! I'm so glad I found this hub, too, because the pictures are beautiful and your quality of writing is superb. I'm linking to it in an upcoming hub I'm doing about the Parkway. You truly capture the beauty and form of these trees in picture and word. Nice! Sasanka7 - Thank you for your insightful comment. If only trees could tell us of all they have seen! Very nice hub. I appreciate your love for trees and giving us a chance to see through your eyes. Those are unique in texture and it's value. We become nostalgic when think they are the silent witness of the ages, races, kings, history, Thanks for sharing. LadyLyell - Trees are certainly amazing, not only for their beauty, but for all of the other things they give us, like food, fruit and flowers. Thank you for stopping by to read and comment on my hub. I love trees too and always had trees in our yard wherever we lived. I wrote an article on "Trees of the bible" which brought to my attention the benefits of the olive tree. You would be interested I'm sure to know more about the "Milkwood tree" it features in a hub I have coming up soon. Every type of tree has a story. I had a one hundred year old Magnolia tree in the yard at my last house and how beautiful it was when those flowers came out. Your photos are amazing and I appreciate your sharing all the knowledge, thank you! Debby Bruck - Nature's beauty is always awe inspiring, and I particularly love taking a close-up look at trees, flowers and plants. Thanks so much for your comments! Sofs, Sometimes it seems that trees are as individual as people - it's interesting to try to discover hidden facets of their personalities! Thanks for stopping by to view my hub! Stephanie, I love the way you have captured the tree.. each picture is so amazing. Thanks for sharing!! great photos of trees! voted up! Oceanssunsets - The beautiful Angel Oak Tree seems to be a favorite. It's so enormous that it was difficult to get a photograph that would do it justice, but the gnarled trunk and branches do show up well in the second picture. Thanks so much for commenting on my hub! Stephanie, I love your trees, and all the barks and gnarls and textures here. This is right up my alley, nature in all its rugged glory. Thanks for sharing. :) I think I love the first or second photo the most. Beautiful! Simone Smith - I'm so glad that these images of Trees and Tree Textures brought you a scent of the forest and of trees! Isn't it odd how sometimes a smell can become so real, even though we know it isn't there? Thanks for stopping by to leave your feedback! Beautiful indeed! I loved these images, and though it might sound strange, I could almost *smell* them as I scrolled through the Hub. I love the way trees smell.... almost as much as I love how they look! I'm so glad you enjoyed this! It's such a nice complement - I appreciate it! Stephanie, thank you for this wonderful treat, I am bookmarking so I can come back and enjoy again. Hi Peggy, Well, I'm glad I beat you to it for a change! :) You have done many hubs on subjects that I have waiting in the wings - it seems that we enjoy many of the same places and things. Thanks for the link! Your hub on Sequoia and Kings Canyon National Parks has some wonderful photographs of trees and gives so much information. This is sure to be a winner in the photo galleries contest. Believe it or not, I was thinking of doing a similar thing...even have some photos...but you beat me to it! Your photography is spectacular and your explanations show your love of travel as well. Thanks for the link to my Sequoia and Kings Canyon National Parks hub. Will be linking this one to mine as well. All the ups except funny! LOVED THIS!!! Thanks for linking, Denise. I'll do the same! Stepanie-I just added this hub as a link to my tree hub. This Hub is so beautiful and well written, too. Great job! Melovy - haha... you describe my feelings when I was trying to decide which photographs to include here. I'm so glad you like my pictures of trees and tree textures! Thanks for stopping by to see my photo gallery and to comment! Jennifer - When we travel west and southwest in our RV, I find that I love the colors of the desert, the cacti and the rocks, but there's nothing like coming back east to the tree covered hills, forests and tree lined streets. I guess there's something to love wherever we are, but I would miss trees, too, if I lived in a place where there weren't any. Thanks so much for your comment and your vote! maybe I like them all. I absolutely loved it! There aren't many things as beautiful as the "moss" covered trees in the south. Growing up in the mid-west I absolutely love trees. I miss trees. After I moved to Boise, named "The City of Trees", I am a little disappointed. Trees can be found by the river or where people water them, otherwise it's all sagebrush. Voted up! Emichael - The park near New Orleans is Fountainebleau State Park located on the shore of Lake Pontchartrain. It has a campground and some beautiful places to walk and picnic. I'm glad you enjoyed the hub. Thanks for stopping by to visit! 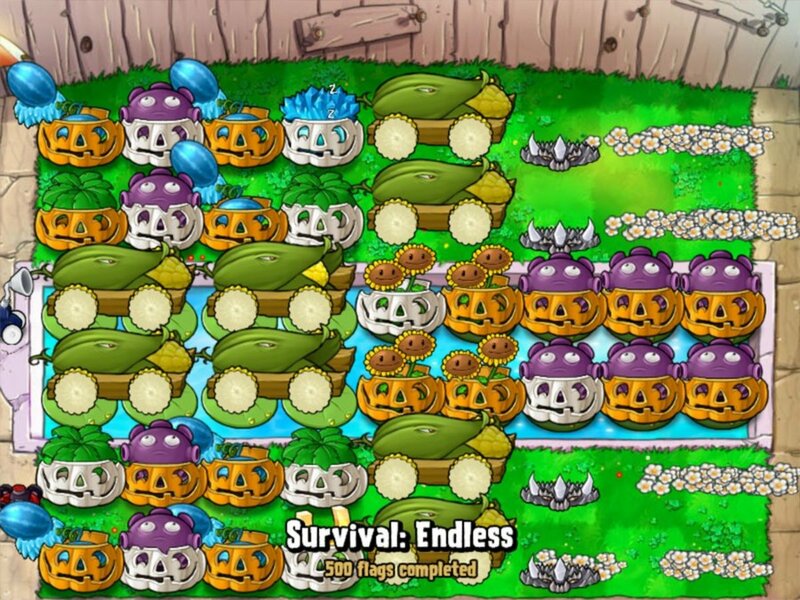 This was a great idea for a hub. Which park in New Orleans were those trees in? Audubon? Imogen French - The Angel Oak seems to be a favorite - I'm not surprised as it is magnificent! Thanks you for your very nice comment! FloraBreenRobison - The first two photographs are both of the Angel Oak Tree. The tree is so huge that a distant picture doesn't do justice to the twistings and turnings of the thousand plus year old branches. It's really amazing. 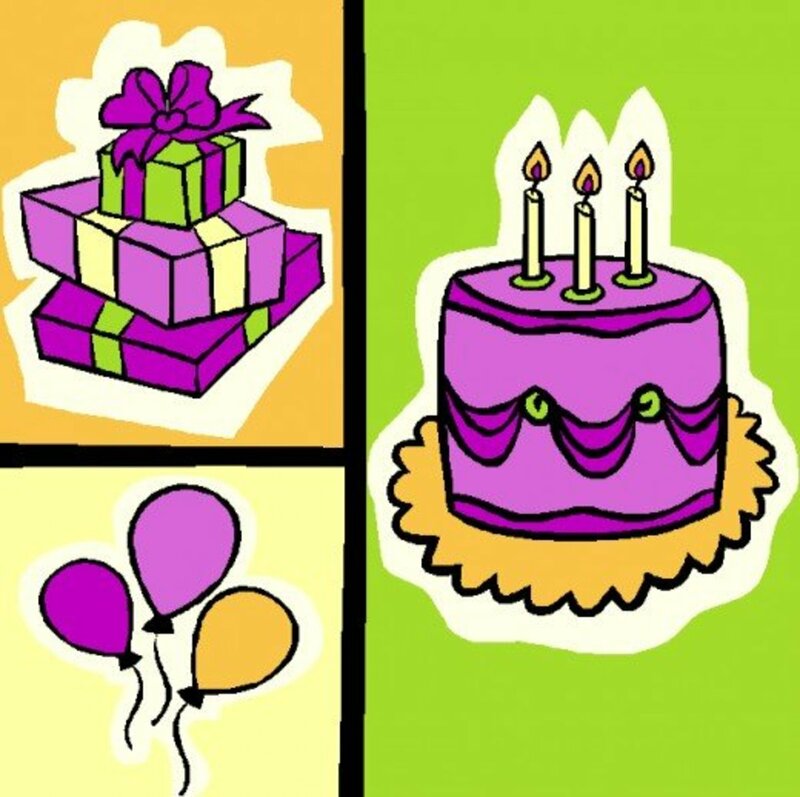 Thank you for stopping by to comment and for your good wishes, too! These are wonderful pictures, Stephanie. I particularly love the ancient angel oak, and the old gnarled and twisted trunks. Trees are truly magical and so is this hub - thanks for sharing. I love trees and the first couple of photographed trees are quite unique in their shape. These are beautiful. Congratulations on hitting 100 hubs. Hi Danette - I diddn't remember the Friendship Tree - I'll have to hop over to Denise's hub to refresh my memory! Trees are so much a part of our environment that we a likely to take them for granted - I did enjoy focusing on them in this hub. Thanks so much for stopping by to comment and for the reminder about the Friendship Tree. Wonderful hub on trees - I love trees and can't imagine living in any place without them. Your photos are absolutely awesome! Are you familiar with the Friendship Tree in Gulfport, Mississippi? My sister (Denise Handlon) included it in a hub she wrote on trees. She saw it when she came to visit me when I lived there 5 years. It's a great old oak. Carmen H - The Angel Oak tree is magnificent! Can you imagine the history that has lived under those spreading branches? I hope you do have a chance to visit someday. Once again, thank you for stopping by to see my trees and textures photo gallery. Plinka - I looked it up and see that a Taxus baccata is a yew. Though they would be worthy of inclusion here, I don't think any of my photos are of yews- maybe next time!. Thank you for your comments and thanks for encouraging me to learn something new! Millionaire Tips - Trees offer unending, interesting subjects for photographers - keep snapping those pictures! Thank you for your comments here and for your support of my photo galleries! Denise - I love the smells of trees, too. Each forest or wooded area seems to have its own scent. Of course, you can't capture a smell, though sometimes I look at pictures of the rain forest and can almost get a whiff of that damp, greenness. Your enthusiastic support means so much to me. Thanks so much for your votes and for sharing my hub! This is a great tribute to trees, with such gorgeous photographs. I too really admire trees and seem to be taking pictures of them wherever I go. I love old trees, especially Taxus baccata. Nice hub, voted up! Stunning pictures once again, Stephanie! I like the first picture of the oak tree best. Stephanie-you have captured my heart with this hub! I love trees and, like you, their textures, the colors, and even how they smell...weird as that may sound. The photos are exquisite, really! And, you've inspired me to take a trip to that place to see it for myself. It is just awesome! Great job-rated up and across I just posted it on my FB page.